Galvanized steel sheet refers to a process that covers mild steel with a layer of zinc to provide good corrosion resistance. Stainless Supply offers G90 Galvanized steel, meaning that the zinc coating is a minimum of 0.90 ounces per square foot (total coating, both sides of the sheet). If equally applied to both sides of the G90 Galvanized steel sheet, there would be a minimum of 0.45 ounces on each surface. If you need any fabrication (hemming, rounded corners, bending), you must select the "cut to your size" option. The maximum thickness G90 Galvanized steel sheet metal that we can offer bending is 16 gauge. The maximum thickness G90 Galvanized steel sheet metal that we can hem is 22 gauge. 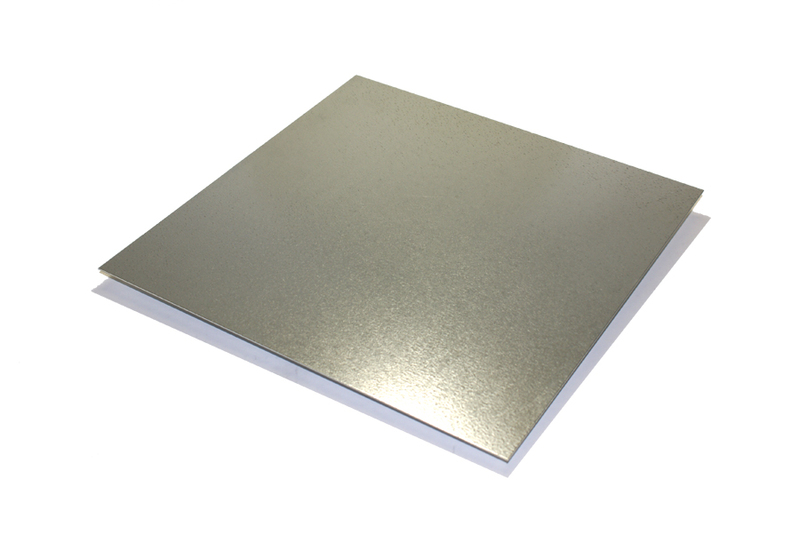 Galvanized steel sheet metal is a very common structural material used in the automotive industry, construction, bridges, frames, electrical towers, signs, air conditioning systems, appliance parts, high strength cables and many other uses. Galvanized steel sheet metal is easily formed and easily welded. Galvanized steel sheet is a great choice when low cost and relatively high strength are required.